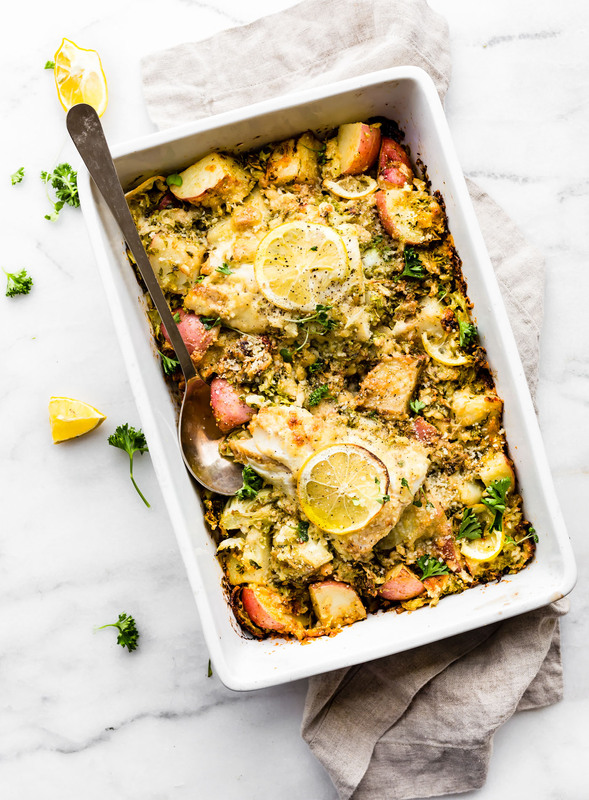 Honey mustard baked fish and vegetable recipe is a quick one pan meal ready in 30 minutes! 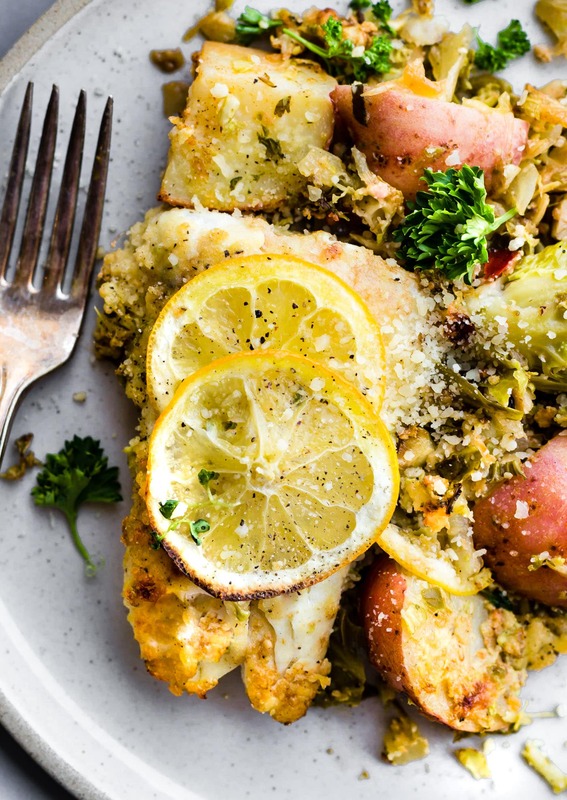 A complete meal with healthy, light fish, then baked with wholesome vegetables. Yes, even non fish lovers like it! And all it takes is just a few simple real food ingredients. Promise! Get a healthy dinner on the table in no time ya’ll! Paleo friendly. Hello hello!! Yesterday ended up being a self care day and did not do ANY WORK day! Okay I lied, I did so some. But y’all, it was so needed. I got my hair done and did normal human things. Haha! I also decided it was A okay not to have a a real content calendar during summer months. Yup. Are you cool with that? I mean, I have recipes and content ready to be shared, but I also know that people are taking time off these days and away from computer etc. The last thing I want to do is keep people glued to the computer. I encourage that R&R and getting outside. That’s my plan too! Once I finish the cookbook (one month and counting). That being said, I’m ALWAYS here via email if ANYONE needs more recipe ideas, questions, etc. Now, back to today’s post! 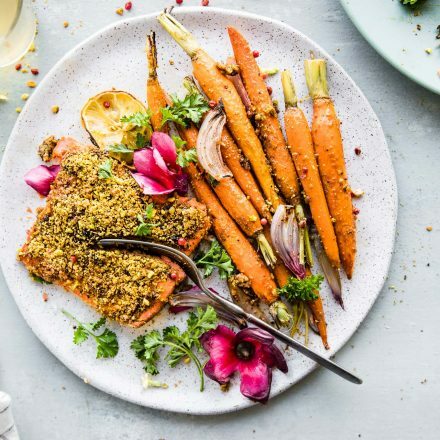 Honey Mustard Baked Fish with Vegetables! 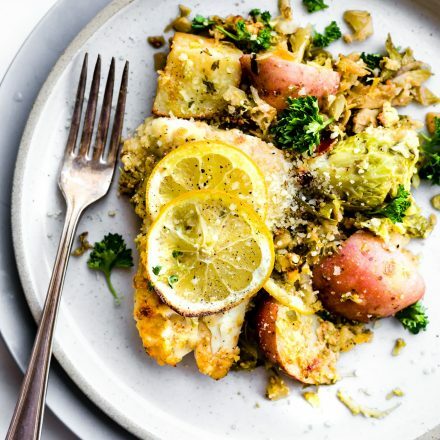 This One Pan Meal is actually a favorite fish dish recipe from almost 3 years ago. I liked it so much fined tuned it! And decided to share the love again. In fact, I’ve been going back fine tuning some of my favorite recipes. Like the turmeric lemonade! Yum, so good! And so refreshing to update those oldie but goodie recipes, ya know? Anyway, this past weekend I made my favorite one pan fish dish using sizzlefish haddock and cod. The new recipe really simplifies the ingredients, but also makes it more scrumptious! I kid you not. When I cook one pan meals, I focus on making them balanced. This means healthy fats, protein, carbs, and flavor. Hey, good taste has to be included, right? 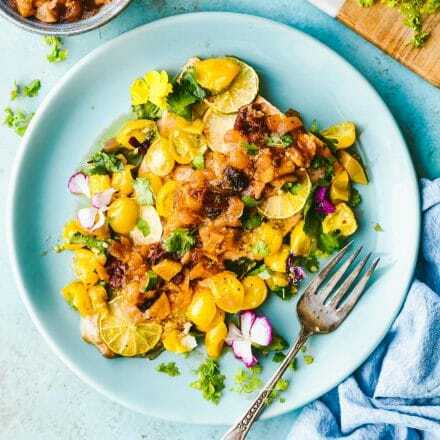 And when it comes to baked fish and vegetable recipes, you definitely don’t want it to be bland, that would be a waste. Flavoring is KEY to make the whole one pan bake fish meal come together. Now I know what you’re thinking. … How in the world do you flavor fish along with all the other ingredients in the ONE PAN? Here’s my baked fish trick. 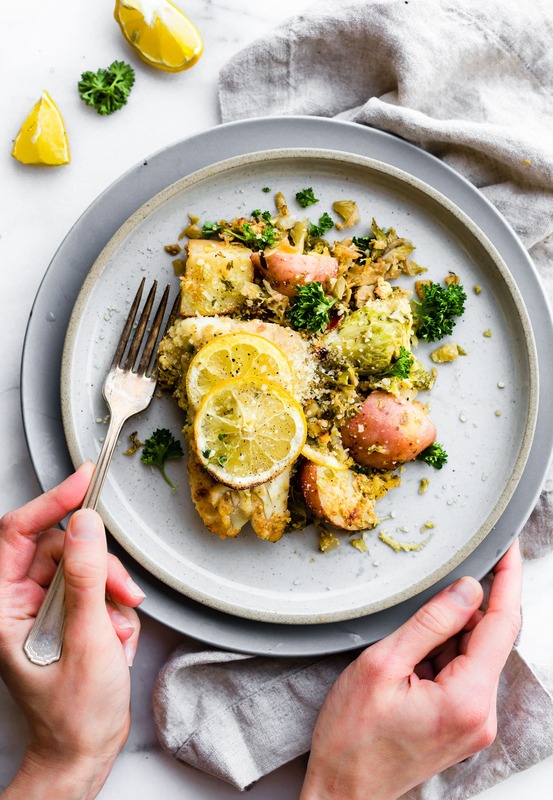 —> Try pairing light fish (like cod or haddock) with a starchy vegetable (Squash or potatoes or carrots) and then pan frying the starchy vegetables in butter or coconut oil/avocado oil first. Keep the other veggies more green based, like spinach, kale, etc. When it comes to the fish marinade or topping, try using a sweeter marinade for light white fish. I used a honey mustard dressing/marinade. 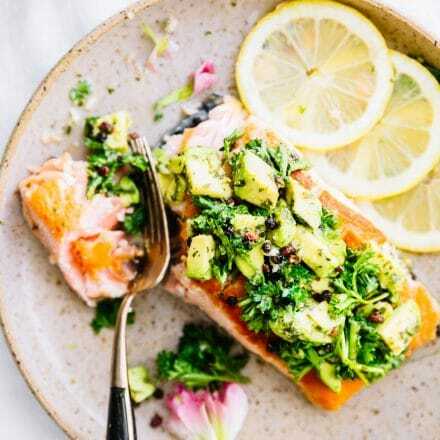 If you are cooking with fattier fish, such as salmon, I find just using lemon, garlic, herbs, and olive oil keeps the flavor light. Not too heavy or overpowering. Moving forward now, here’s what’s new and updated with this Honey Mustard Baked Fish with Vegetables! Note: I updated it on the original post as well. Just so ya know. For one, we used Honey mustard dressing/marinade to coat the fish. Or you can make your own! Super simple. Just whisking ingredients together honey mustard, red wine vinegar, and some spices. Then pouring it on the fish to marinade a wee bit. We also pan fried new potatoes in avocado oil. You can use coconut oil or butter as well. You have the option of baking the potatoes in the one pan (versus fry pan) before adding your vegetables and fish. But trust me, the potatoes wont’ be nearly as crispy and tasty. Just my two cents. 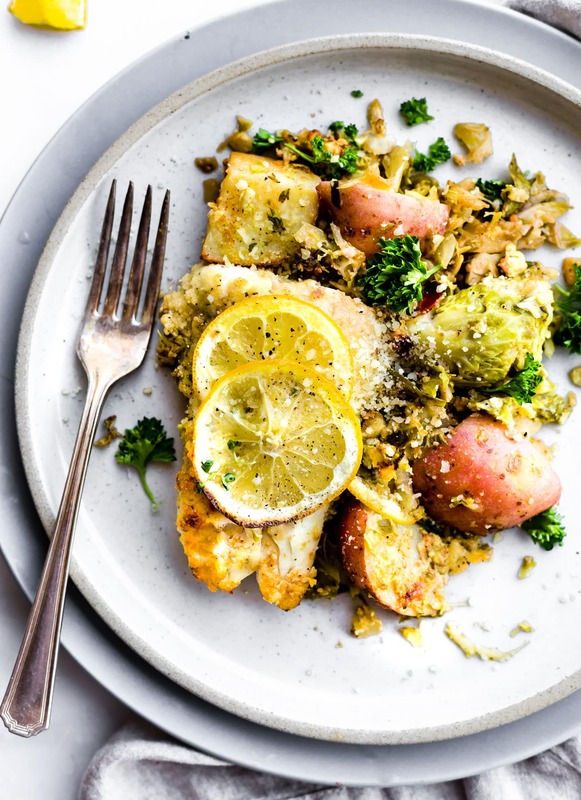 Okay, so once we get those new potatoes lightly fried, you just toss together with brussel sprouts shavings, and then your fish Cod, Haddock, or even Tilapia work! Add lemon slices, parmesan (optional but you should so add it!! ), and bake it up! IT SMELLS AMAZING!!! And tastes even better. Wash and clean your vegetables and fish fillets. Cut Potatoes into quarters and finely chop Brussels sprouts or place Brussels sprouts in a food processor to create shavings. Next, lightly pan fry your potatoes in 1 tbsp oil or butter, 1/4 cup onion, garlic, and a pinch of sea salt/pepper. Cook until potatoes are slightly tender and onions start to caramelize. About 10 minutes on medium heat. Next, coat your fillets in the mustard dressing and lemon juice then set aside. 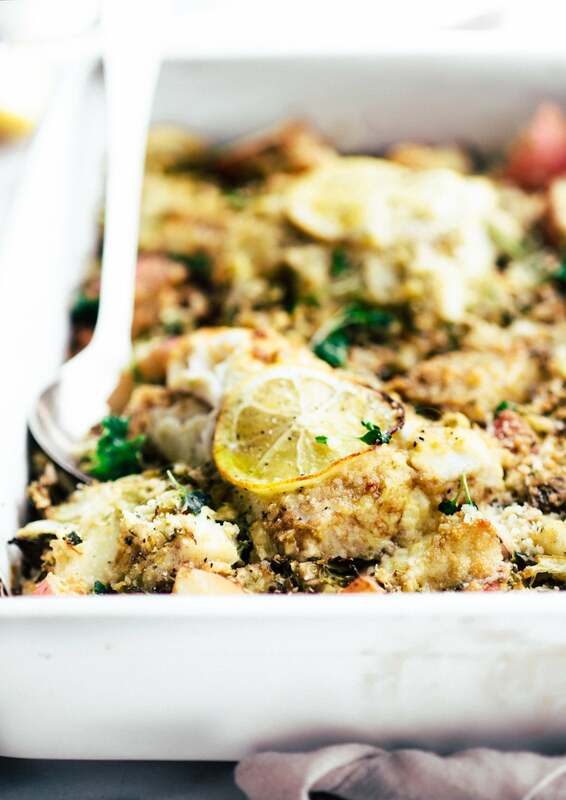 Combine your veggie mix and potatoes/onion together in a casserole pan or sheet pan. Make sure to include all the oil and garlic from the frying pan when you cooked the potatoes. Mix the vegetables together with splash of balsamic vinegar and your seasoning (paprika, salt, pepper, etc.) Then place your fish fillets on top. Pour any extra honey mustard dressing over the entire casserole/pan coating the veggies as well. Sprinkle with optional parmesan or feta cheese. Bake at 450F for 14-17 minutes. Check how the veggies are doing at 14 minutes. If tender then broil the last minute to make Brussels sprouts crispy! Remove and garnish with red pepper flakes and parsley if desired. Salt/pepper to taste. To make paleo, omit cheese. You can use Cod, Haddock, or any other white fish. Tilapia will cook faster so be sure to check on that during baking process. One pan meals. Oh goodness, we love them! I mean, throw everything in a pot or pan, cook, serve, bam! You’re done. And if you’re like us, maybe you make a couple of dishes and save some for the next day? Leftovers for lunch is like GOLD! 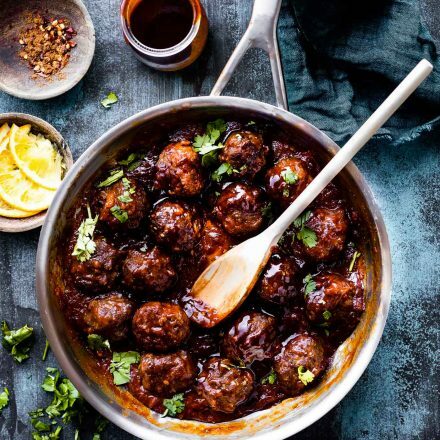 Save a ton of time in the kitchen and make week night dinners delicious and healthy. BEST PLAN EVER. What’s your favorite ONE PAN meal? Thanks for reading. You know you can always email or comment here for ANYTHING. Happy to help. This sounds SO good! I love all the flavors being used! it’s one of our favs! so simple too! Ooh potatoes plus fish sounds like a really good combination. I’ve never had haddock before (I don’t think.) I’m glad you had a more restful day, because you are always working so hard and producing so much content. It’s amazing to me how you are so productive! thank you friend. That means a lot! Definitely saving this to try this summer! All of my favorite things in one! yay! i hope you enjoy friend! I still want to know your version! Pretty please? Yup.. totally making this soon! OMG that’s hot! Come visit! Great recipe!! Great combo of ingredients & flavors!! Perfect for summer! thanks Deborah! Let me know if you try it! I’m so proud of you taking a self-love day! Getting my hair done is one of my favorite things in the world. If I would have someone wash my hair every day, I’d be in heaven. Love the one pan idea, and you know I love Sizzlefish. We’re going to be eating a lot of Sizzle this week (as always). Absolutely LOVE honey mustard — such a fun idea to encrust fish with it! It’s a keeper, that’s for sure! Love this idea and it might just get my kiddos to eat fish! Win! for sure! Let me know if they try it!! This sounds incredible! I’m a huge honey mustard fan! I LOVE THE FLAVOR BEING USED. My. Family loved this! Thanks! YUM! I’m a huge honey mustard fab!